Saturday- Woke up at 5:30 and met Whitney at A.F. park and ride by 6:00. We headed to Provo for the Pioneer Classic 10K. I was nervous this was only my second time running for an hour straight. The buzzer sounded and the race was on. We started out good I was full of adrenaline and excitement! The the hill started pretty much right away. We got to what seemed to be the top of the hill and then the turn came it was straight up and defiantly not over. This is the point that people started turning around and running backwards. This was where I began to speed walk. Psh I have not trained for anything like that beast! They weren't kidding when they said this is Goliath! I sure felt like Daivd for a few minutes there. Then we passed the 1 mile marker still climbing the hill. I thought wow a whole mile up hill. I bet my time is going to be extremely long, oh well I just need to finish! We got to the top and there was a water stop thank goodness! From then on it was up and down up and down finally down the South side of the Provo temple and back to Timpview high school. Okay so maybe I am mean or some call me competitive , but we were at mile 4.5 and there were some girls in front of me that were with us most of the run and I didn't want them to beat me. I took off I passed them and realized I still have 1 more mile left to go. I kept going and passed a few more people. 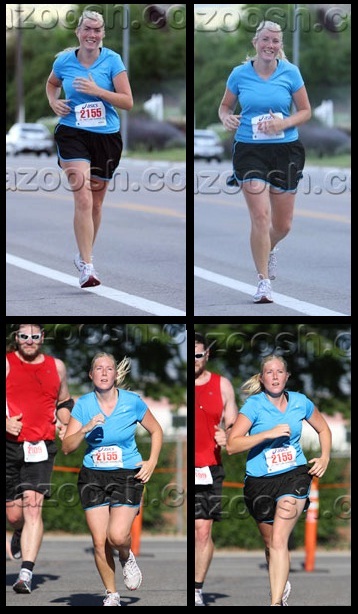 There I was crossing the finish line at 1:06:09!! I thought for sure I'd finish at 1:30:00 with all the walking Goliath made me do. I finished with a 10:40 pace not my best time, but hey something to look forward to beating! Mike, Pey and Ashton came and found us at about mile 4 or 5. Ashton took some pretty amazing pictures, I had fun editing a few adding some color! The first two are about mile 3 I think. The last two are crossing the finish line and I'm looking at my time. Whit finishing, she looks killer awesome huh! We celebrated by going to Gandies! Way to go Nik! I think you did awesome. Hey and we need to get together again... school starts very soon! Dang girl! You are awesome!! I need to come train with you! I have not been doing so hot on my training. I blame school and my laziness! :) Let's get together soon! I am proud! You are GREAT!